These "6" x 6" watercolors are filling me with enthusiasm. On the right is a new one that I finished earlier today! This is the front porch of the charming older home south and next door to us. In my files I found several photos of this porch and I painted from these photos. 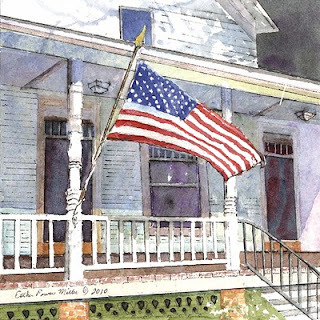 Attached here is a copy of this painting, which will be reproduced with details to be given laterl This painting has a crisp white top mat with a narrow edge of medium gray underneath. Size including the mat is 9.5" square. This matted print will be placed on a foam core backing, enclosed in a clear plastic envelope and carefully packaged for free shipment inside the U. S. Inquire about international shipping costs outside the U S.
This painting will be sold to the first person to contact us with secure payment of its purchase price of $108.00 (including shipping within the US). This offer will expire on April 27 (about 10 days from now). To purchase this painting Email us at info@painterandpoet.com or call Esther at 574-842-8888. PayPal and other credit cards and money orders accepted. If desired, we can send you a Paypal invoice. And remember, paintings look different on different computer monitors; if you purchase this painting and are not fully satisfied, you may pack it carefully and return to us at your expense and we will refund your full purchase price. No questions asked. 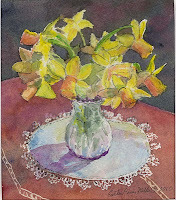 I've been working on several other 6"x 6''s and am posting another recent watercolor that never made it to our blog. This one is 5" x 6". It was adopted by a dear friend, who LOVES spring flowers. She brought me more wonderful daffodils and similar blooms. I've taken lots of pictures of these spring flowers and hope to squeeze another cheery little watercolor daffodil into this blog very soon. They are special favorites of mine. "The one that got away" is several paragraphs up. Culver Academy's Reunion week will be here in about a month, and we are readying our inventory of Culver Academy prints and cards. I'm hopeful of making good progress on a new Academy scene, and will also be pushing myself on several of my larger commissions. 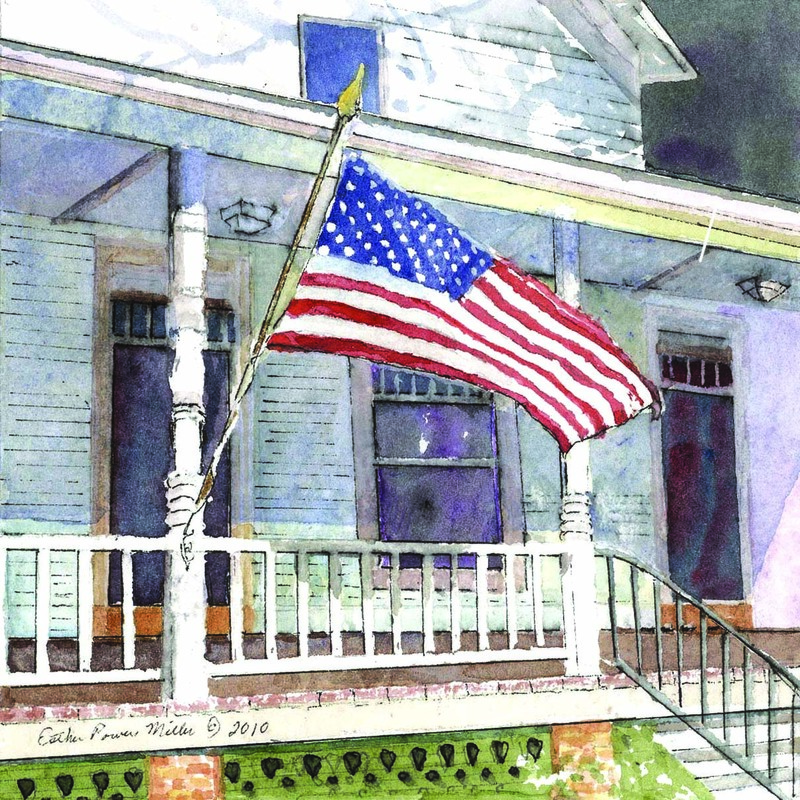 And tomorrow, we are sending a French Quarter New Orleans original to Melanie, a granddaughter who has lived in that fascinating city all her life. Her birthday is several days away and that puts me a bit closer to my goal of presenting each grandchild with a significant original. In our next blog, I'll post a photo of "New Orleans Buggy for Melanie."